The cold and rain bring hazards that one needs to keep in mind when working, but winter doesn’t have to be a complete nightmare. As long as everyone knows where potential hazards lie and how to treat them correctly, winter can go off without a hitch. Proper and regular training by a professional consultant is important to get to know your own health and safety responsibilities, and to understand how to build a safeguard for your workspace. Working in the cold is not only uncomfortable, it can also seriously impact your judgement: things often are rushed, fingers lose their grip, and the mind gets focused on other things, like the hot bath you’re taking later. Injuries do happen as people tend to get irritable and incautious in the winter weather. That’s why working in teams and checking on each other’s behaviour and safety precautions can prevent accidents and sloppy work. Make the effort to bring rain shielding, blankets or even a portable heater. Even when you are having to scrape ice off your windshield and gritting the site – these heat conductors are an appreciated investment. Stiff fingers and limbs can make manual handling difficult and dangerous. If you are working with your hands a lot, you need to make sure you can still operate machines and tools as usual, by wearing and taking regular breaks in between. Prepare for work to take longer in this time of year, as you will have to warm up frequently by having a hot drink inside. Also, dressing in layers as opposed to a few, thick clothing pieces, can help feeling more comfortable and reduce the risk of getting a cold. By taking off the most inner layer, which will get sweaty and eventually wet and cold, the body will stay dry and warm. The same goes for gloves, headwear (such as inner layers of helmets) and socks. When paths are slippery, they need treating with grit. Using the right kind of grit and the right amount at the correct time is essential: if it rains shortly after grit was applied, even if it’s just a quick drizzle, the surface will need a second coat. 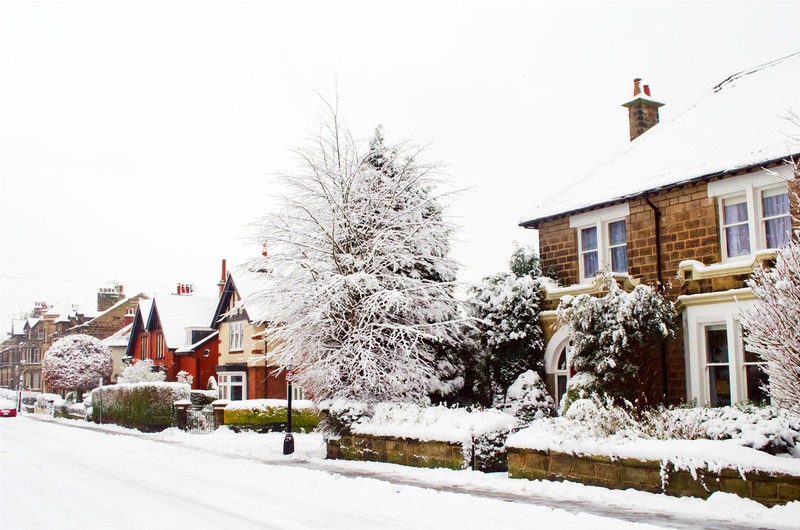 Some areas might not be treatable with grit, such as roofs, and simply need to be avoided when they’ve frozen over. Existing shortcuts tend to get very dangerous in the winter. Wet soil and fallen leaves become a slip and slide that, might just end in a broken ankle. Taking extra time aside to consider every potential hazard and carrying out countermeasures is key. People with preexisting conditions, like painful joints, stiffness or arthritis, find them becoming more severe during winter. They can affect your productivity and overall well-being so don’t take them lightly: daily exercise can help and prevent pain in many cases. Exercise also helps with a healthier sleep, feeling more energetic and focused and releasing stress. Heart attacks occur more commonly in cold weather. People with existing heart diseases and older people shouldn’t exercise too hard and know how to spot signs of a heart attack and how to react in that situation. That goes for colleagues and friends/family members, too. People experience winter tiredness during the colder months, which can make it much harder to get out of bed and causes you to feel sleepy during the day due to less sunlight. Less natural light means your brain produces less melatonin, which makes you feel tired and lose focus. Why not just start working an hour early this winter? Using the most productive hours of the day to get work done in the daylight will help to keep you energised. On top of that, starting early means finishing early – what could be more motivational than that?